GAZA CITY, Gaza Strip (AP) — Gaza’s Health Ministry said early Tuesday that paramedics recovered two bodies after an overnight Israeli airstrike near the perimeter fence with Israel. The Israeli army said an aircraft targeted Palestinians who approached the fence and placed what the military said was a suspicious object. The Gaza-Israel frontier has been volatile for months. The militant Hamas group leads weekly marches against a blockade Israel and Egypt imposed on Gaza when Hamas took control in 2007. On Monday, thousands gathered on Gaza’s Mediterranean beach, near the fence separating the territory from Israel. Some activists sailed in small fishing boats near the fence, flying the Palestinian flag. Israeli gunboats shot around the boats. Israel said some protesters on land burned tear gas and threw stones, and that troops fired tear gas and live rounds. 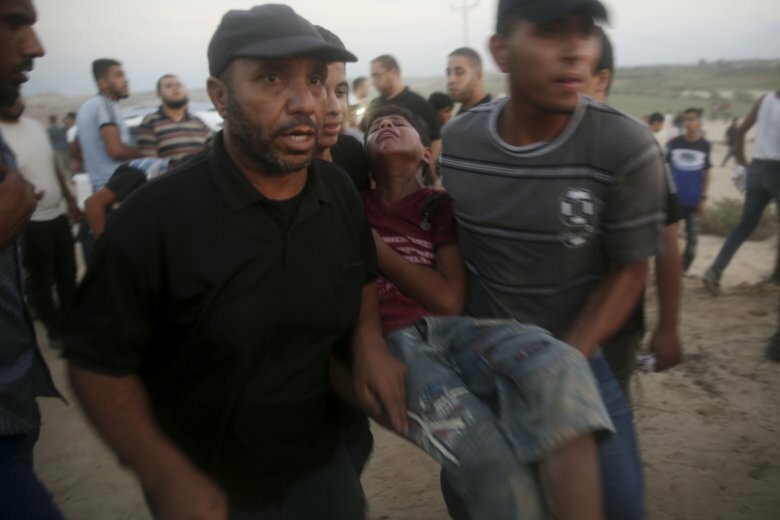 Twenty-six protesters were wounded by Israeli army fire, Gaza health officials said. Israeli fire has killed at least 131 Palestinians during the protests which began in late March.